Delta: Using precision prismatic lenses that are encased in stamped steel with vacuum metalized reflectors, these direct replacement headlight conversion kits from Delta will provide the superior lighting you need! 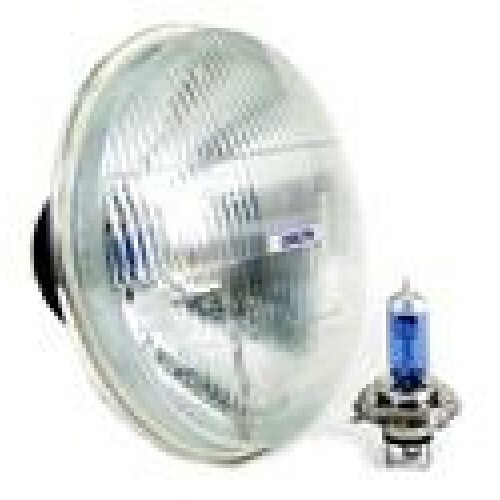 The classic round headlight kit for 1st Gen Toyotas and all other applications that take 7'' large round headlights offers a domed lead crystal lens that is popular for restoration applications. Available with Xenon H4 bulbs that are rated at 60/55 watts and feature both high and low beams. Sold in Pairs. Available in round or square. These headlights are made by Delta Tech, a premier European manufacturer in automotive lighting equipment. Includes two headlight housings and two Xenon H4 bulbs. Will convert your stock sealed beam headlights to modern H4 bulbs. Retains all factory wiring and uses factory connectors. These Xenon style bulbs are halogen bulbs with a blue tint. The blue tint makes the light appear more white compared to the yellow glow of a regular halogen bulb. They feature high and low beams of 60 watts and 55 watts respectively.